Home grown Harrison Lillis rose through the ranks in Gillingham, appearing in the NIHL South’s second tier with the Invicta Mustangs as early as 2009/10 aged just 16. Whilst still splitting his time with the under 18s, the skater managed 7 points in his first 15 appearances as a senior – a tally that would see him continue with the side the following year. In 2010/11 he then dressed 23 times for the Mustangs, managing 2 goals and 8 assists in the process, before stepping up to make his debut for the Dynamos in 2011/12. Aged 18 Lillis would feature on 19 occasions for the Mos in a campaign that saw him net his first NIHL South Division 1 goal – a milestone that was then later eclipsed by his first senior hat-trick in a playoff encounter with the Cardiff NIHL Devils. The following term he would divide his time between the Mustangs and the Dynamos before once again seizing his opportunity to impress in the post season as he stepped in to plug a defence ravaged by injury in the playoffs. 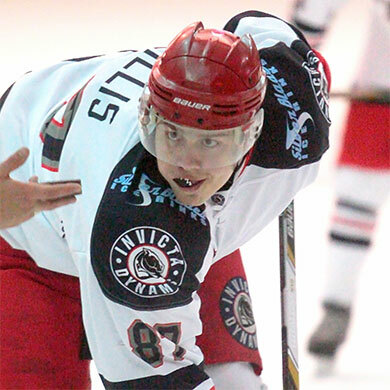 Strong performances against both Cardiff and Chelmsford helped secure his roster spot for 2013/14 but, after 30 further games in Gillingham, the defenceman opted to test himself in new surroundings and switched to nearby Streatham for the remainder of the season. Now though the 20 year old is back at his home town club where he has already pulled on the Dynamos jersey 94 times before 2014/15 gets underway.